Head's World! : Episode 31: The Second Sword of the Atom Special and a Third Anniversary! Episode 31: The Second Sword of the Atom Special and a Third Anniversary! This is a special month for Head Speaks. Four years ago, I went and watched Jay and Silent Bob's Groovy Cartoon Movie. Then three years ago, I released my first episode of Head Speaks. Now it's three years later and I present to you.... Episode 31: The Second Sword of the Atom Special and a Third Anniversary! First up on we look at A Little Head, where I once again talk about my podcasting origins. The Atom is relating a tale about while they were rebuilding New Morlaidh, they were attacked by warriors on warbirds. These warriors had been attacking other tribes that had popped up after Morlaidh was destroyed. They would steal the women and kill the men that tried to stop them. When they attacked New Morlaidh, they took Laethwen. Atom questioned the one surviving warrior and discovered that their leader Torbul, has implanted chips in his people that can monitor them and kill them with a small bomb (that apparently The Wall would still in a couple of years). The only reason he can talk freely is that his injuries damaged the implant. If they could destroy the equipment, Torbul’s own men would join Atom against him. Then their captive died. We get to “present” time where we see Atom has been relaying this story to Norman and Paul. Paul then tells his own story how Jean was having Ray’s stuff moved out. One of the workmen tripped and activated the shrinking ray which shrunk Jean down. They then decide to hunt down Ray to see if he can help them return her to normal. Once arriving in the jungles, they too were attacked by Torbul’s men. Jean was captured and their guides ran away. Paul blames Ray for everything and Ray agrees. He then gives his size changing belt to Paul and shows him how to work it, in case anything happens to him. Meanwhile we cut to the prisons where Laethwen is being held, who meets her new roommate, Jean. Rays’ ex and current flames begin conversing with each other. As Ray, Norman and Paul are going over plan to rescue their lady loves, they are once again attacked by the warbirds. Norman accidentally drops a transmitter they were going to plant on one of the birds and Paul gets pulled away by one of the birds, shrinking down in the process. Not able to defeat the pink skins, one of the warriors calls off the attack. With Torbul, he watches this on his monitors and detonates the bomb in that man’s head for calling off the attack without orders to. He then goes to the cells to examine the wild women that were brought in. As one of the guards takes Laethwen to get cleaned up and brought to Torbul, we go back to Ray and Norman discussing a scintillation detector that Norman used to find old Morlaidh. Ray has an idea to use the device to locate the belt and in turn his friends. 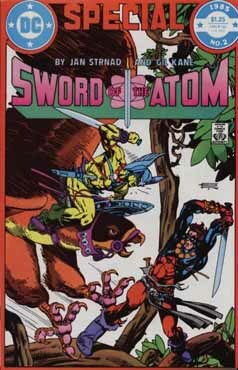 After finding Torbul’s castle, Atom and Voss dress as warriors and infiltrate the stronghold, leaving Norman as back up. Once inside, they get stopped as one of the guards notice that Atom is a ‘pink skin’ and is in an area he shouldn’t be in. Once him and Voss are scanned, the guards discover that they don’t have a chip in them. The two men are exposed and taken to Torbul. Meanwhile, Paul sneaks in to Jean’s cell, shrunk down. He then shrinks them down to escape her cell. As they make their exit, they’re stopped by several guards. Paul then sets the belt to enlarge and starts growing bigger and bigger, crushing the walls and ceiling. In front of Torbul, he’s laying out his plans to Atom. He informs our hero that once he starts his breeding program, everyone that is born will have an implant. Atom knocks Torbul back in defiance, which allows him to reach his machine, turning a switch causing everyone to enter a murderous rage and attack The Atom. Ray throws an ax in to the machine destroying it and Torbul’s influence over the populace. Ray again knocks Torbul down, which this time allows him in grabbing distance of Laethwen. Torbul pulls a knife and puts it to the Princess’ neck. Before he can cut her throat, the floor starts cracking as Paul comes busting through. As Torbul tells his people to kill the “giant”, Laethwen smacks him upside the head with her chains. Ray and everyone else walks away leaving Torbul amongst his ruins, ranting about how all traitors deserve death. At this one of his ex-guards shoots an arrow through his mouth, killing him. Jean and Paul head back to America where Jean discovers that Paul still has Atom’s belt… and he might use it again some day. Back with Atom and Laethwen, she’s informing him that Jean kept talking about her lawn back home and how she thinks she’ll have Jean send her one. The story ends with Atom carrying Laethwen off in to the sunset. At 1:23 we have "Head's Bookshelf". This month I briefly look at a Young Adult series called Cape High. Then at an hour thirty we see: "Where’s Head Going?" This episode, I look at the podcast: From Crisis to Crisis: A Superman Podcast by Michael Bailey and Jeffery Taylor. This show, follows the rebirth of Superman from the Man of Steel mini-series (written by John Bryne) after The Crisis up until Infinite Crisis. It's a great show and one of my major influences. Be sure to check the guys out. And this month, I don't play a final song. Debating on not doing that anymore. I'm on a Podcasting Facebook group and there's been a lot of talk on there about how podcasts can get in trouble for playing others songs like I have been, so I'm considering dropping that. Be sure to join me next time for another fantastic episode of The Head Speaks HeadCast as we check out the Atom during the Crisis on Infinite Earths!